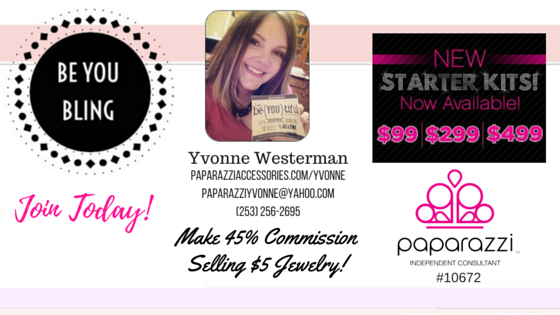 tag: BeYouBling: Awesome June Special!! Fabulous time to join this amazing company!! Awesome June Special!! Fabulous time to join this amazing company!! Lots of sunshine, longer days, and loads of bright, fun colors make the summer season a perfect platform for Paparazzi success. This June we invite you to take your summertime Paparazzi parties to the next level with the exclusive Summer Party Pack! Loaded with 25 assorted accessories in everything from bold summer colors to bestselling neutrals, this exclusive collection will be the talk of the season – and only those who qualify will receive one! Throughout the month of June, when you place an order for 150 pieces (300 PV) or more, you’ll receive a Summer Party Pack for FREE! That's 25 extra accessories absolutely FREE! Whether you choose to use these bonus pieces as exclusive Hostess Rewards or sell them for 100% profit, your Paparazzi fans will flock to see what all the buzz is about. What does the Summer Party Pack include? It contains a total of 25 assorted rings, necklaces, hair clips, headbands, bracelets, and earrings in a variety of styles and colors. You’ll find bright summer shades and classic neutral tones, future Blockbusters and hidden classics – all guaranteed to fuel your summer sales! New Consultants won’t be left behind! We are including a Summer Party Pack in every single Starter Kit purchased during the month of June. That’s an unheard of 25% more accessories in the $300 Starter Kit! If there was a perfect time to join Paparazzi, NOW would be it! Looks like your summer just got a little hotter!